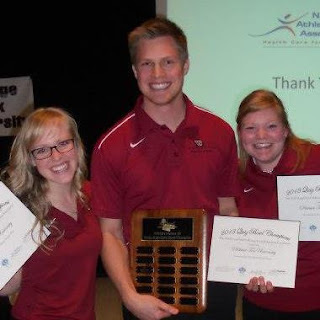 The Whitworth Quiz Bowl team took first place at the annual District 10 Northwest Athletic Trainer’s Association (NATA) Quiz Bowl in Boise, Idaho, March 15-16. The team beat the 10 other accredited athletic training programs that competed, including Boise State University, University of Idaho, George Fox, Linfield College, and Oregon State University. Whitworth’s team members were seniors Lauren Dickey, Andrew Knox, Heidi Hendrickson, and William Decker. The Quiz Bowl competition focuses on knowledge of the five domains of athletic training: injury and illness prevention and wellness protection, clinical evaluation and diagnosis, immediate and emergency care, treatment and rehabilitation, and organizational and professional health and well-being. “We had been preparing for the NATA Student Quiz Bowl every week since January, and we knew the content well,” says Dickey, who plans on attending graduate school to complete a master’s degree in athletic training. Knox says the keys to their victory were the extensive coursework and preparatory efforts made by professors and teammates. Some of his favorite things about the Whitworth athletic training department, he says, are the relationships he’s developed with his professors and fellow students. This is the second year in a row that Whitworth athletics training students have won the competition. In June, the team will travel to the National Athletic Trainer’s Association symposium in Las Vegas to compete against 10 other districts in the national Quiz Bowl competition. Cynthia Wright, Ph.D., ATC, assistant professor of health sciences, athletic training program director, Whitworth University, (509) 777-3244 or cwright@whitworth.edu.